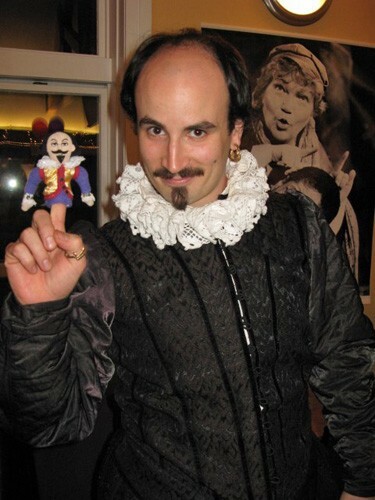 Even Will, who celebrated his 444th birthday this year, took a break from his writing to enjoy a little fun at Shakespeare and Company. Kevin Sprague Photo. Director Kevin G. Coleman prepares the cast of The Ladies Man. Kevin Sprague Photo. The Ladies Man at Shakespeare and Company in Lenox. Photo by Kevin Sprague. 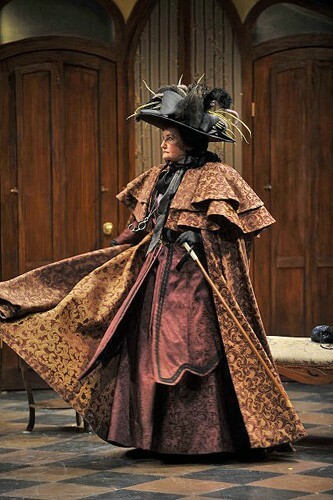 Annette Miller in The Ladies Man at Shakespeare and Company in Lenox. Photo by Kevin Sprague. Elizabeth Aspenleider simply floors a surprised Jonathan Croy. Kevin Sprague Photo. 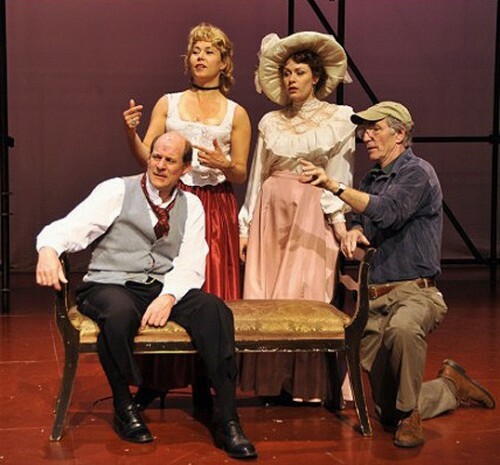 The plot celebrates merry mayhem in The Ladies Man at Shakespeare and Company in Lenox. Photo by Kevin Sprague. The hilarity never stops at The Ladies Man at Shakespeare and Company in Lenox. Photo by Kevin Sprague. 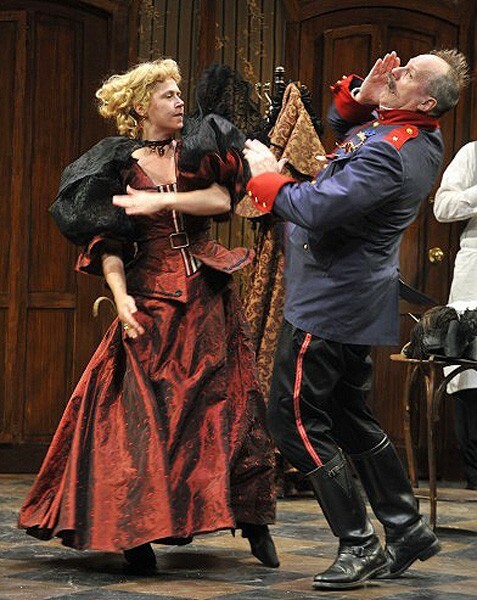 Things get out of hand in The Ladies Man at Shakespeare and Company in Lenox. Photo by Kevin Sprague. There are two happy endings in The Ladies Man at Shakespeare and Company in Lenox. Photo by Kevin Sprague. Directed by Kevin G. Coleman. With Elizabeth Aspenlieder as Suzanne Aubin, Jonathan Croy, Dr. Hercule Molineaux, Dave Demke, Etienne, Annette Miller, Madame Aigreville, Caley Milliken, Marie, Michael F. Toomey, Bassinet, Julie Webster, Yvonne Molineaux, and Walton Wilson, Gustav Aubin. Set Designer, Carl Sprague, Costumer Designer, Govane Lohbauer, Lighting Designer, Les Dickert, Sound Designer, Michael Pfeiffer Production Stage Manager, Hope Rose Kelly, Assistant Director, Renee Speltz, Costume Design Assistant, Cathy A. Gray, Assistant Stage Manager, Eric Harazi, Assistant Lighting Designer, Chris Thielking, Run Crew, Alex Hurst, Lights, Sarah Stephenson, Sound, House Management: Dana Harrison, Sarah Brown, Hal Smyth, Eric Corbett Williams, Wardrobe, Jillian O'Connell. Through August 31. What an evening of theater! It begins innocently enough with a muffled laugh here, a chuckle there. Soon waves of laughter start to roll through the audience. 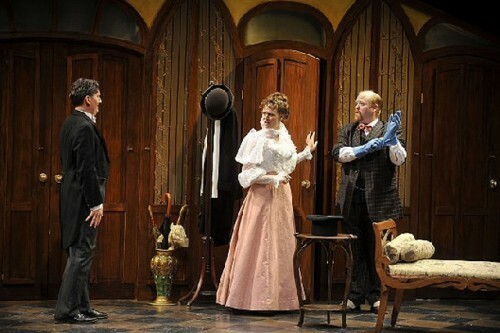 Comedy has returned to the Berkshires thanks to this wonderful new play, done in the broad French farce style, as in "This French broad is a farce!" 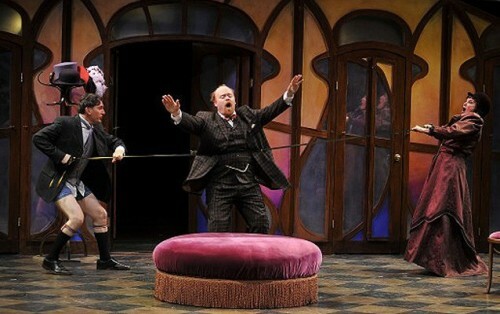 It has been freely adapted from the works of Georges Feydeau, master French farceur of the late 1800's. Once again Shakespeare & Company risks all with a plunge into a style of theatre they have never tried before, presenting what turns out to be one of the funniest plays I have seen in years, possibly decades. This venerable company has just entered its fourth decade, and is in great danger of becoming a Berkshires institution. Clearly neither Artistic Director Tina Packer nor Managing Director Nicholas Puma are about to let this company become moribund in the process. They and their loyal band of Berkshire supporters have a willingness to keep trying new things. And we are the beneficiaries. Bless them. I love my Shakespeare, but I am equally mad for farce. Around these parts we have long been starved for the real thing, for honest to god belly laughs. I have been living on a bland diet of comedic kibble and bits but this, this my friends, is the filet mignon. Within moments of its start, the play begins tickling the funny bone. This quickly grows to outright laughter as the complications onstage grow. Only the grumpiest of souls can remain immune to the wordplay and silliness. It didn't take the opening night audience long to give in to the patently absurd situations taking place in rapid succession. When I could tear my eyes away, I watched the audience. Otherwise sensible adults were surrendering to their long suppressed inner child, and I noted some very dignified neighbors doubled over in sheer enjoyment, helpless against the comedic onslaught. 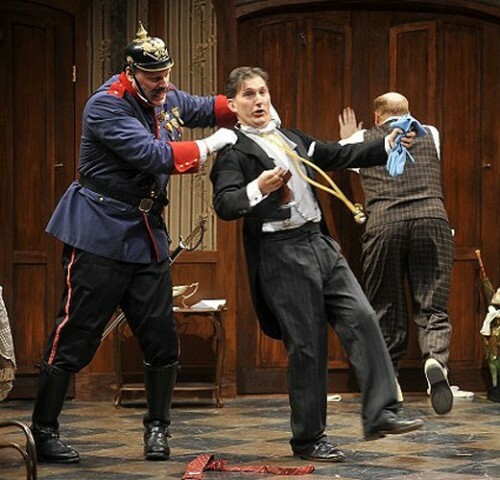 French farce is an over-the-top kind of comedy that is punctuated by slamming doors, double entendres and ridiculous French and Prussian accents. 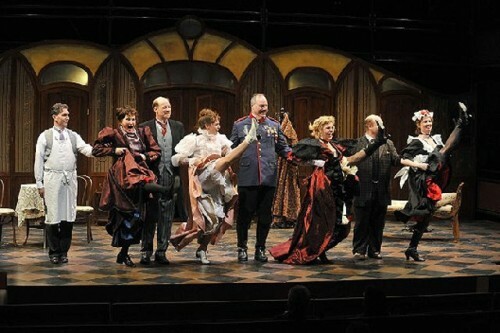 The script by Charles Morey used Feydeau's Tailleur pour Dames ("The Ladies Dressmaker") as its base, with bits and pieces of his other works included to fill out the evening. French and English humor are distinctly different, but amazingly Morey brings the two very different aesthetics together with panache. The story begins with a misunderstanding between Doctor Molineaux and his beautiful wife Suzanne. As he tries to smooth things over with a few white lies he digs himself in deeper and his predicament starts to whirl out of control. Brilliant casting brings back the team that made the Company's Rough Crossing such a delight last season. Julie Webster plays the beautiful wife and Jonathan Croy the physician husband. They are the foundation - the "straight men" if you will - for this work, with the outrageously drawn characterizations of the other characters playing off their less cartoonish demeanor. Thus we meet the speech impaired and bumbling Bassinet (Michael F. Toomey), a sort of sidekick to the Doctor, and the cuckolded Prussian officer Gustav Aubin (Walton Wilson). The maid and manservant ( Dave Demke and Caley Milliken) are somehow able to keep up with the ever-changing wishes of the Doctor. But each time they save his bacon, another door flies open and a new problem emerges. As Feydeau famously said: "Whenever two of my characters absolutely, positively under any circumstances shouldn't meet, I put them in the same room together." It is to the ladies that two of the most hilarious roles ever written are given. The play's hot-to-trot Suzanne Albin is played by the company's master comedian, Elizabeth Aspenlieder. She has been applauded by no less than the Wall Street Journal as the "greatest comedian of the year." As the irrepressible Suzanne she has simply outdone herself. Farce is hard work, but she makes this demanding form of comedy look easy. The other plum role went to Annette Miller as Madame Aigreville, the doctor's mother-in-law. Referred to as "Medusa" because of the silhouette created by her hat, she enjoys a wonderful theatrical conceit for her entrances and exits. The overhead lights darken, the double doors are flung open, and her imperious silhouette stands threateningly in the doorway while fearsome chords from Mozart's Don Giovanni announce the arrival of this, the doctor's most feared adversary. The moment is the very definition of drama. At her arrival the audience hushed, and I heard my seatmates draw in gasps of air. But soon we were all laughing again, as the five doorways and two side entrances were in full swing, opening and closing as the plot thickens. One cannot mention the doors without calling attention to the art nouveau set that contain them. It is gorgeous yet clever in its simplicity, nicely designed by Carl Sprague. Somehow the stage manages without the teasers and tormenters, the black drapes that usually mask the peripheral lights and rigging. It results in every inch of the stage being utilized, a tradeoff that works to the audience's advantage. The costumes were equally well done, evoking both the Victorian and Can-Can fashions with authenticity. The second act takes place in the dressmakers shop. It seemed that dresses were not actually made there, but it was popular for trysts and sexual encounters, perhaps as a house of ill-repute. It is the middle of the second act that the play reaches its peak, with pandemonium breaking out as half the cast tries to hide from the other half. By this point the audience is roaring and screaming in surrender to the pratfalls and improbabilities taking place before their eyes. Sitcoms on TV are the anemic descendants of farce. Three's Company, Will and Grace and Woody's wedding episode on the Cheers series are some examples. However, the moment a scene builds to hilarity, broadcasters cut to a commercial. On stage there are no interruptions - it's just nonstop wit and hilarity for two plus hours. By the end of the scene in the dressmaker's shop, everyone is united and celebrating. The play could have easily stopped at that point, and the audience would have left laughing and happy. But playwright Morey has one more surprise, a clever denouement that provides a happy ending for our long suffering Doctor. This serves to prolong the action--possibly a little longer than necessary. Still, since the whole evening grew from his inability to admit he had a sexual inadequacy problem it was nice to see it solved without the need for Viagra. In Feydeau's A Flea in Her Ear I once counted an astounding 300 entrances and exits, and I am sure The Ladies Man is not far behind. I was too absorbed to count. I may return again for that task. Clearly I thought this production one of the best I have seen in many years. Still, there is no guarantee that you will like what I like. That said, I think this is the play that you can take your friends and out of town guests to with confidence. It is a wild and hilarious theatrical roller coaster ride with many unexpected twists and turns, reaching fast and dizzying speeds as you hang on to your seat. At the end of the opening night performance the audience did something I have not seen often in the theatre. There was - instead of the ritual standing ovation - there was loud, raucous cheering and screaming from the ticket buyers. And the biggest smiles on people's faces that I have seen in a long time. One suggestion: If you go, be sure to bring your own seat belt. This is as close to ROTFL (Rolling on the Floor Laughing) as you will probably ever experience at a live show. If you see graffiti that says "For a good time, call (413) 637-3353." Do it. It is the number for the Shakespeare & Company box office. The Ladies Man runs in repertory until August 31.